How much better does food get in the fall than when you combine the best of the harvest in butternut squash with caramelized onions in a buttery and flakey crust? Umm..yeah…it doesn’t get much better than this. This one’s is a winner, people. I knew immediately when I saw the post for this show up on my Google Reader that it would be making an appearance in my kitchen very shortly. I had all of the ingredients except the fresh sage, for which I substituted dry sage, and after having recently made a tart-like sweet version, I knew that I was capable of making this one. There was no question what I’d pair this with – the maple braised pork chops I had planned to make yesterday – which worked out perfectly since the chops were in the crockpot and I’d have some extra time to devote to preparing this galette. As Deb at Smitten Kitchen encouraged her readers to make this, I’ll do the same. This galette isn’t something you should pass up because it might look a little intimidating – believe me, it’s easier than any single or double-crusted pie you’ll ever make. And the results are just phenomenal. The crust in one word: absolute perfection. 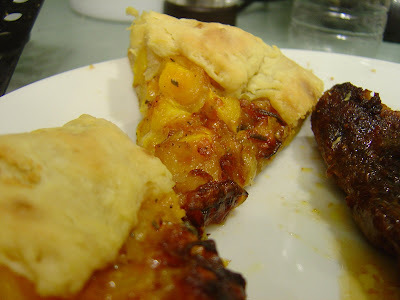 It’s flakey, buttery, and light…and the filling is all that I expected it to be soft, sweet, savory, with a little bit of a bite from the gruyere that I used rather than the fontina the recipe calls for. I’ll make this again and again, and am considering making it this weekend for my girls-night-in dinner party. I did follow the directions as they were written: freezing the flour mixture and butter for an hour first then preparing the dough by hand and refrigerating it for another hour. 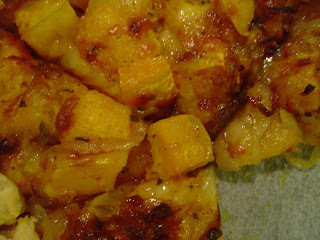 While at first glance, this seems a little time consuming, there’s not a whole lot of actual preparation going on, and the refrigeration time gave me plenty of time to roast the squash, caramelize the onions, and do a few dishes. 😉 Overall, the recipe was quite simple but result was extraordinary! Prepare squash: Preheat oven to 375 degrees F. Peel squash, then halve and scoop out seeds. Cut into a ½-inch dice. Toss pieces with olive oil and a half-teaspoon of the salt and roast on foil lined (for neatness sake) sheet for 30 minutes or until pieces are tender, turning it midway if your oven bakes unevenly. Set aside to cool slightly. Caramelize onions: While squash is roasting, melt butter in a heavy skillet and cook onion over low heat with the remaining half-teaspoon of salt and pinch of sugar, stirring occasionally, until soft and lightly golden brown, about 20 minutes. (This took more like 30 minutes on low to medium-low heat) Stir in cayenne. Assemble galette: On a floured work surface, roll the dough out into a 12-inch round. Transfer to an ungreased baking sheet. 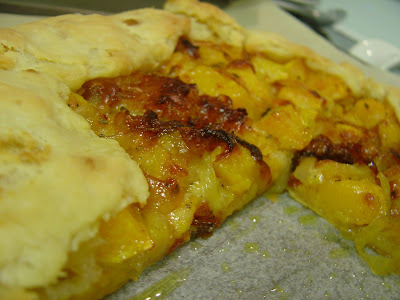 (I used a piece of parchment paper on the sheet) Spread squash, onions, cheese and herb mixture over the dough, leaving a 1 1/2-inch border. Fold the border over the squash, onion and cheese mixture, pleating the edge to make it fit. The center will be open. I made this a few days ago (I saw your comment on Smitten Kitchen ;)) and I loved it too! So easy, but so comforting.